The debut of a stunning new voice in fiction a novel both heartbreaking and transcendent After four harrowing years on the Western Front, Tom Sherbourne returns to Australia and takes a job as the lighthouse keeper on Janus Rock, nearly half a day's journey from the coast. To this isolated island, where the supply boat comes once a season and shore leaves are granted every other year at best, Tom brings a young, bold, and loving wife, Isabel. Years later, after two miscarriages and one stillbirth, the grieving Isabel hears a baby's cries on the wind. A boat has washed up onshore carrying a dead man and a living baby. Tom, whose records as a lighthouse keeper are meticulous and whose moral principles have withstood a horrific war, wants to report the man and infant immediately. But Isabel has taken the tiny baby to her breast. Against Tom's judgment, they claim her as their own and name her Lucy. When she is two, Tom and Isabel return to the mainland and are reminded that there are other people in the world. Their choice has devastated one of them. M. L. Stedman's mesmerizing, beautifully written novel seduces us into accommodating Isabel's decision to keep this "gift from God." And we are swept into a story about extraordinarily compelling characters seeking to find their North Star in a world where there is no right answer, where justice for one person is another's tragic loss. 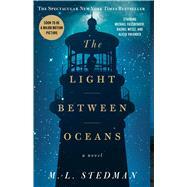 The Light Between Oceansis exquisite and unforgettable, a deeply moving novel. “We wouldn’t normally send a single man to Janus—it’s pretty remote and a wife and family can be a great practical help, not just a comfort,” the District Officer had said to Tom. “But seeing it’s only temporary… You’ll leave for Partageuse in two days,” he said, and signed him up for six months. There wasn’t much to organize. No one to farewell. Two days later, Tom walked up the gangplank of the boat, armed with a kit bag and not much else. The SSPrometheusworked its way along the southern shores of Australia, stopping at various ports on its run between Sydney and Perth. The few cabins reserved for first-class passengers were on the upper deck, toward the bow. In third class, Tom shared a cabin with an elderly sailor. “Been making this trip for fifty years—they wouldn’t have the cheek to ask me to pay. Bad luck, you know,” the man had said cheerfully, then returned his attention to the large bottle of over-proof rum that kept him occupied. To escape the alcohol fumes, Tom took to walking the deck during the day. Of an evening there’d usually be a card game belowdecks. “Leave her alone,” he said as he stepped into the cabin. He spoke calmly, but left no room for debate. “But I haven’t finished. I was just going to make her day.” He reeked of drink and stale tobacco. “McKenzie. Private. 3277.” The unrequested serial number followed like a reflex. “Now, out!” Tom said, and the man, deflated by sudden sobriety, shuffled from the cabin. “You all right?” Tom asked the woman. “Being over there changes a man. Right and wrong don’t look so different any more to some.” He turned to go, but put his head back through the doorway. “You’ve got every right to have him up on charges if you want. But I reckon he’s probably got enough troubles. Like I said—up to you,” and he disappeared through the door.